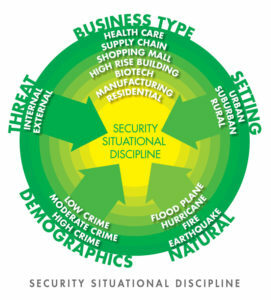 Security is a Situational Discipline as the graphic on the left depicts. This means one size does not fit all. It also means that each security program must be proportionate to the totality of the ambient threat environment. The first variable is a function of the industry being served. Clearly the security needs of a Shopping Mall differ from the security needs of a Hospital or an electronic Supply Chain Warehouse. The Situational nature of security programs is also affected by variations in the Threat Environment, such as the Crime Rate. Certain regions of the country are more or less susceptible to the threats of both man made and/or natural disasters. Finally some industries are more or less affected by either Internal or External threats, which are the product of a wide range of variables. We at SMSI Inc. factor in all of these variables, and others, as we proceed through assessment process culminating in the development of a need driven, comprehensive security program, including physical security, security personnel. access management and/or CPTED design. If you are contemplating a comprehensive review of your security program, in terms of efficacy, cost effectiveness, within the context of a well defined threat environment, give Bill Nesbitt a call at 805-499-3800, or email: bill@smsiinc.com. No other company has a more complete understanding of both the operational aspects of the healthcare security environment combined with unparalleled technical expertise. All of our hospital security assessment reports are supported and explained through the use of photographs. For the past 16 years SMSI Inc. has been providing Security Consulting and Training Consultant services in a variety of settings with a major focus in the Healthcare Security industry. We have provided our expertise to over 90 hospitals, providing security assessments, training, and representing hospitals in security litigation as a Security Expert Witness. SMSI Inc. has been retained by hospitals with as few as 30 beds to some with over 500 beds. SMSI understands the unique aspects of the healthcare environment. Hospitals must provide a secure environment for patients, visitors, and employees. An often neglected aspect of many Hospital Security programs is an aggressive asset protection strategy. There are significant opportunities to bring more dollars to the bottom-line through improved asset protection programs. Hospitals continue to accept the unabated losses of linens, food products, office supplies, and much more, including fixed assets. We, at SMSI Inc., are familiar with JCAHO standards. We understand the impact of standards set by HIPAA, EMTALA, OSHA and even HCFA on security requirements. Furthermore, Bill Nesbitt, CPP, Certified CPTED Practitioner, is a member of ASHRM, IAHSS, ACHE, and is a member of the Healthcare Security Council of ASIS International. Learn more about SMSI’s Hospital Security Consulting Services. There are divergent security needs for both enclosed malls as well as strip malls. These needs have been significantly impacted by the events of 9/11. We know that in the future terrorists are going to be attracted to soft targets containing large groups of people. Retail, Mall and Shopping Center Security programs must sufficiently protect both interior and exterior (for example, parking facilities) common areas. We provide the benefit of sound security programs, especially on attracting traffic. Security programs must be designed to benefit both the management company and the tenants as well. SMSI knows how to cost effectively apply an appropriate balance between manpower, training, and technology. We belong to ICSC and the International CPTED (Crime Prevention through Environmental Design) Association. 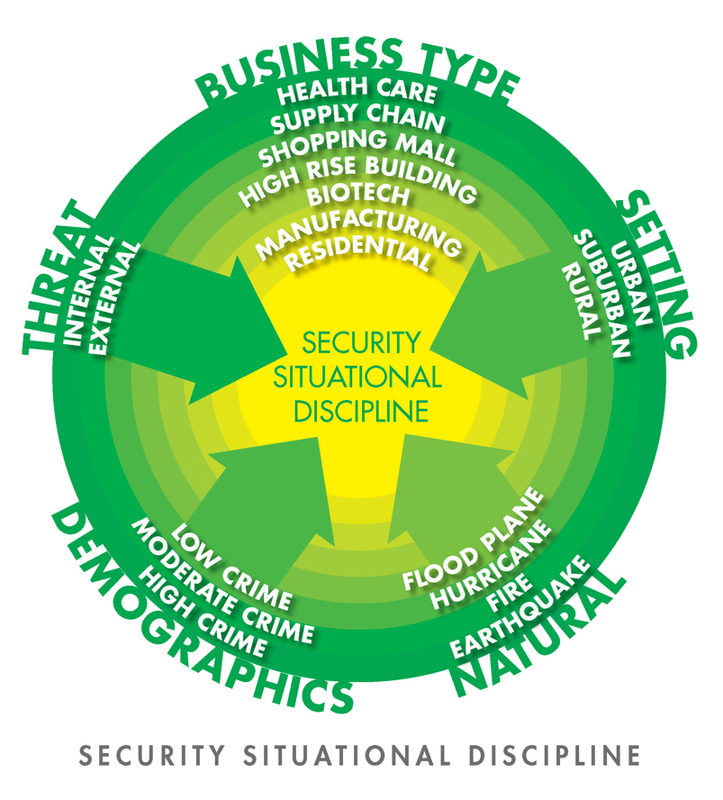 Learn more about SMSI’s Shopping Center Security Consulting Services. SMSI Inc. uses the term “Commercial Facilities,” to describe organizations that are generally open to the public. It is these facilities the produce the lion’s share of security derived lawsuits. SMSI has direct experience in this arena, having testified as a security expert witness in over 300 such lawsuits. Commercial Security involves facilities, such as high-rise office buildings, must also be concerned about the continuing threats of terrorism and active shooter mitigation. Stand-off buffers may need to be established. The use of security technology can be a very effective adjunct to any security program. Unfortunately, most security programs are reactive and often receive intense attention only after something bad has happened. Experience tells us that the cost of reaction is from two to four times more costly than proaction. Many Commercial Facilities fail to optimally involve their tenants in the security program, an endeavor that can improve security while significantly reducing liability…. Learn more about SMSI’s Commercial Security, Corporate Security, and Office Buildings Security. SMSI Inc. uses the term “Industrial Security,” to describe organizations that are generally not open to the public. Industrial sites include, but are not limited to, manufacturing facilities, transport terminals, communication centers, supply chain and warehouse operations….. Learn more about SMSI’s Industrial Security, Manufacturing Security, Transport Terminal Security, and Warehouse Security. Hotels and motels have a high standard of care to meet when it comes to protecting the public. Hotel guests are entitled to a reasonable expectation that they will be safe and secure while they are guests. Hotels also have significant asset protection issues that are exacerbated through bar and restaurant operations. A Hotel Security program must address both “front-of-the-house” as well as “back-of-the-house” vulnerabilities. The hospitality industry is often the brunt of security lawsuits because they generally do not avail themselves of professional security assessments. This industry has a tendency to wait until it is too late. Learn more about SMSI’s Hotel Security Consulting Services. One of the often neglected links in the airport security chain are FBOs. FBOs are often the point of least resistance for those seeking to pierce an airport’s security net. Private aircraft are often vulnerable to theft and/or hijacking. Aircraft service personnel who may have nefarious motives may seek access through an FBO operation. These exposures, and others, if not properly addressed, expose Fixed Base Operators to severe lawsuits and business crippling publicity if they are perceived to have put average citizens in jeopardy. These businesses must develop Fixed Base Operator Security programs that move beyond mere window dressing. Ron Lander, CPP has considerable experience in the design security design for General Aviation Airports. Learn more about SMSI’s General Aviation Security Consulting Services. Of the more than 300 times we have served as Security Expert Witness, many of those have involved Apartment Complexes. The vast majority of those premises liability cases have resulted from various forms of sexual assault. Even gated communities are not immune from criminal activity. Property crime at Apartment Complexes can diminish the ability to maintain full occupancy and decreases the market value of rent. Some complexes go part way by hiring a contract security guard, assuming their culpability has been diminished. However, hiring the wrong agency may actually increase culpability…. Learn more about SMSI’s Apartment Complex Security Consulting and HOA Assessment Services. SMSI Inc. is partnered with the South Central Service Cooperative (SCSC) of Mankato, Minnesota, to offer holistic solutions to school security and loss prevention challenges. SCSC presently provides a wide range of support services to school districts. That experience positions them to understand, from the inside the needs and capabilities of school districts to effectively meet the challenges of today’s realities. SMSI Inc., on the other hand, is a security consulting firm that has been addressing a wide range of security challenges for more than 15 years. SMSI is interested in developing programs to counter the prevalence of school violence that has plagued our nation…. Learn more about SMSI’s School Security Consulting Services.